People line up to buy gasoline at a gas station after an offensive by Mexico's government against fuel theft at one of the country's main refineries has led to days of shortages at gas stations, in Morelia, Mexico, Jan. 7, 2019. Guanajuato's state government said that less than one third of the state's gas stations were open on Monday. "We are changing the whole distribution system, that's the reason for the shortage. We have enough gasoline," he said. 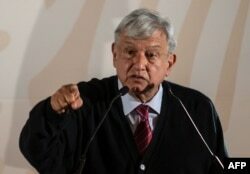 Lopez Obrador's government has ordered the armed forces to intervene in Pemex's facilities, including one refinery. "The supply will normalize, and at the same time we are going to guarantee that fuel is not stolen," said Lopez Obrador, who took office in December. "We have seen a reduction in theft like never before ... but we still have work to do." FILE - Mexico's President Andres Manuel Lopez Obrador presents the new economic program for the northern border zone, in Tijuana, Baja California State, Mexico, Jan. 6, 2019. Guanajuato's governor Diego Sinhue told local radio that of the state's 415 gas stations, only 115 were open. In Leon, Guanajuato's biggest city with a population of more than 1.5 million, only 7 of 196 stations were open on Sunday, he said. "Fuel is becoming a serious problem," said Sinhue, a member of the opposition center-right National Action Party (PAN). "People are really angry about this shortage." Sinhue said the army had informed him it had taken control of the state's Salamanca refinery on Monday morning. There, members of the armed forces were monitoring tankers going in and out of the facility, as well as the pressure of pipelines. Energy Minister Rocio Nahle offered an apology on Mexican radio for the shortages. Asked when the problem would be fixed, she said it was in the process of being "normalized."